Gretsch electric guitars have a style all their own “ a glitzy, wacky, retro charm that over the years has drawn players from all kinds of popular music, from timeless stars to unknown teens. The Beatles, Chet Atkins, Duane Eddy, and Brian Setzer all made their mark with Gretsch, and new bands continually discover and fall in love with the Falcons, Gents, 6120s, Jets, and the rest. The Gretsch Electric Guitar Book comes right up to the present, including Gretsch's alliance to the powerful Fender company, a move that has done wonders for the reliability and playability of the modern Gretsch axe. Every great model is here, but the book also tells the story of the lesser-known guitars and the projects that almost never happened. There are archival and fresh interviews with Gretsch personnel over the years and with many leading Gretsch players, including Chet Atkins, Billy Duffy, Duane Eddy, and Brian Setzer. 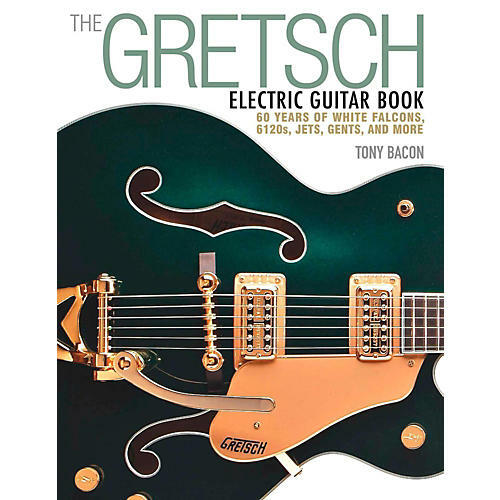 In the tradition of Tony Bacon's best-selling series of guitar books, his updated and revised story of Gretsch is three great volumes in one: a compendium of luscious pictures of the coolest guitars; a gripping story from early exploits to the most recent developments; and a detailed collector's guide to every production electric Gretsch model ever made.